Front row (L-R), Ramapo Provost Stefan Becker and Touro College of Pharmacy Dean Henry Cohen, PharmD. Back row (L-R) Heidi Fuchs, Assistant Dean for Admissions and Enrollment Management, Touro College of Pharmacy; Rena Bacon, Professor of Biology at Ramapo; and Edward Saiff, Dean, School of Theoretical and Applied Science at Ramapo. 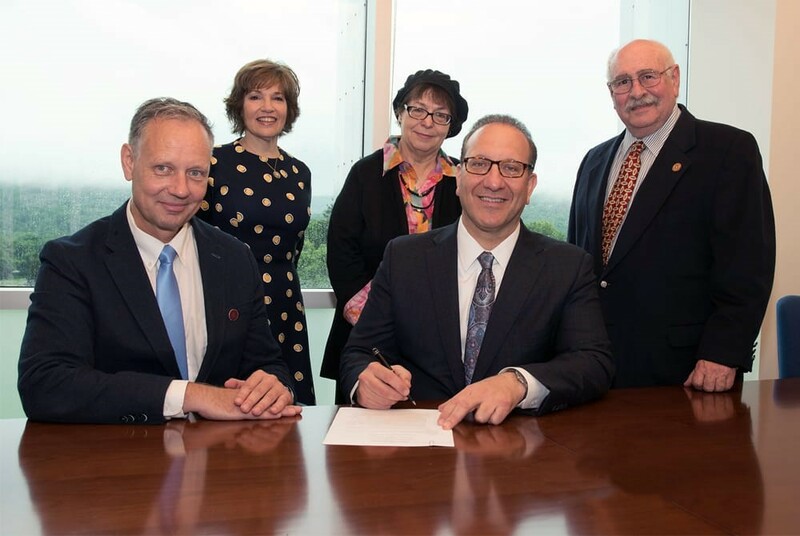 MAHWAH, N.J. – Ramapo College of New Jersey and Touro College of Pharmacy (TCOP) in Harlem have created a new pre-pharmacy program that will allow qualified students to earn both bachelor’s and Doctor of Pharmacy degrees in seven years. The program is designed to put students on a fast track, saving time and cost. Interested students can apply to the program through Ramapo College beginning September 1, 2018. Students would apply to TCOP during their third year at Ramapo, at the end of which they will be required to have completed pre-requisites in science, math, and economics with cumulative GPAs of 3.0 and science GPAs of 2.75. Favorable recommendations, a personal interview at TCOP, completion of the Pharmacy College Admissions Test, and submission of a formal application through the Pharmacy College Application Service are also required. Successful candidates will complete their studies in seven years rather than the eight years usually needed to complete both. Admission to the new program does not guarantee admission to the pharmacy school. Under the articulation agreement, Ramapo agrees to provide counseling, advising and resources to students in the Program. Students admitted to TCOP must satisfactorily complete their first year of pharmacy school to obtain their bachelor’s degree from Ramapo.